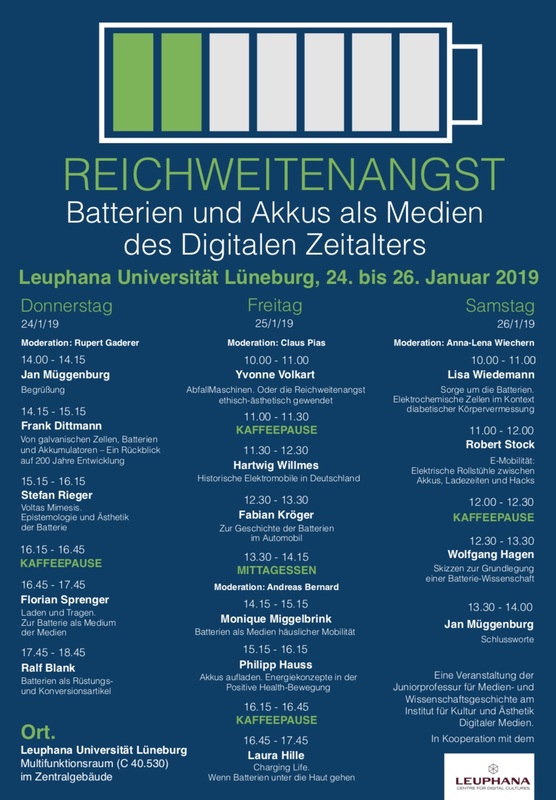 Just coming back from a very inspiring conference about the culture and technology of batteries (Reichweitenangst – Batterien und Akkus als Medien des Digitalen Zeitalters), organized by Prof. Jan Müggenburg (Media studies) at Leuphana University in Germany. Media theorists, historians of technology, and cultural scientists presented their different approaches to this fascinating topic. My own talk centered first on early electrical vehicles and the question of why they did not “win” the competition with the gasoline car. One important reason was that early automobile drivers preferred the non-reliable, adventurous character of the gasoline car, that was seen as a twin of the human soul. In the second part I analyzed how the car battery is represented in contemporary advertising. Even after finding their last refuge on a scrapyard, cars are shown as „living“ artifacts, vivified by the endless power of the car battery. In these visual sources the battery is charged with a religious hope of extended range. Batteries blur the frontier between technology and life, natural and artificial things. Imagined as an object without range anxiety, the battery seems to have a deep link to our hope of immortality. A compendium with all talks will be published in 2020 (Transkript-Verlag). Many thanks again to the organizing team for this conference.